One of the hindrance in ones progress can be fear of failure. Actually we all have unknown fear of something. And that fear is “Fear Of Failure” . 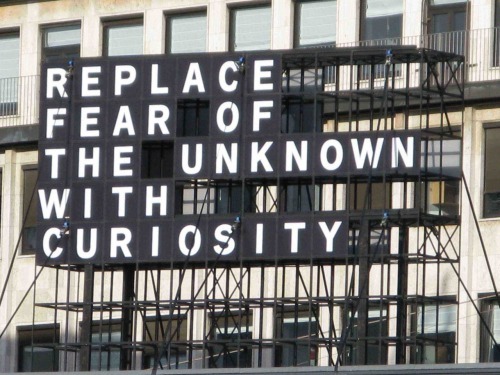 To overcome this I found the best quote “Replace The Fear Of The Unknown With Curiosity”. It is a gradual process. You may not achieve such a mental state in a single day but through constant practice it can be achieved.”Practice Makes The Man Perfect”. And even after constantly trying you are having the fear just ask yourself “Why should I fear?” You will get answer by yourself. Posted in Food For Life and tagged achieve, answer, constant, curiosity, dream, Failure, fear, Fear of failure, food, gradual, Life, make, man, mental, perfect, replace, single day, soul, state, try. Bookmark the permalink.